Its A Great Idea To Line The Inside Of Your Greenhouse During The Winter Its Economical, Quick, Will Frost-proof The Structure And Can Extend The Growing Season For Up To 6 Weeks. Working Out How Much Bubble Insulation You Need And Just How To Fit It Can Be A Problem, So The Chart On The Help And Advice Tap Will Give A Guide To What Youll Need And How To Fit It!the Double Construction Creates A Strong Sandwich Effect Making Our Bubble Insulation The Best Around - Youll Find It Hard To Burst Our Bubbles! - And As The Material Is Uv Stabilised Too, You Can Bank On It Keeping Any Warmth In The Greenhouse For You For Many Winters To Come!our 1.5m (5) Wide, Laminated, Uv Stabilised 20mm Bubble Wrap Greenhouse Insulation Is The Real Deal - Beware Of The Packing Bubble Wrap Where You Can Easily Burst The Bubbles With Your Fingers As This Wont Do The Job. 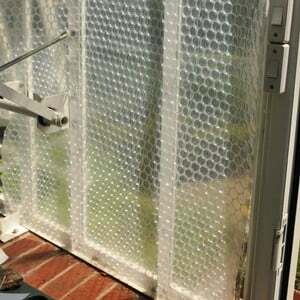 Our Greenhouse Bubble Wrap Will Help To Keep An Unheated Greenhouse Frost Free So Greatly Reducing Fuel/electricity Consumption In Heated Greenhouses, Saving Up To 50% On Heating Costs!the Bigger 20mm Double Laminated Greenhouse Bubble Wrap Insulation Should Be Placed With The Bubbles Facing The Glass For Maximum Insulating Effect. bubble Insulation Is Double Laminated For Added Strength And Durabilityfit To The Inside Of The Greenhouse To Create A Heat Maintaining Double Glazing Effectuv Stabilised So Will Last For Seasonsweighs 102g/sqm (not To Be Confused With Cheaper Versions Weighing Only Half As Much)20mm Double Laminated Bubble Insulation Provides Excellent Light Transmissioncan Cut Greenhouse Heating Costs By Up To 50%!use With Our Alliplugseasy To Fix Up And Take Downwill Last Season After Seasonallispacers Lift Bubble Insulation Off Glass Creating Greater Insulationuse Corner Adaptors For Neat Corner Fitavailable By The Linear Metre Or In Extra Value 10m Rolls. buy Extra Value Pack Twin Pack - 2 X 10 Metre Rolls And Save 15.00!